There are over 4 million motorcycles registered in the United States. The popularity of this mode of transportation is attributed to the low initial cost of a motorcycle, its use as a pleasure vehicle and, for some models, the good fuel efficiency. Motorcycle fatalities represent approximately five percent of all highway fatalities each year, yet motorcycles represent just two percent of all registered vehicles in the United States. One of the main reasons motorcyclists are killed in crashes is because the motorcycle itself provides virtually no protection in a crash. For example, approximately 80 percent of reported motor- cycle crashes result in injury or death; a comparable figure for automobiles is about 20 percent. DefensiveDriving.com online driver safety course has a section dedicated to educating drivers on how to share the road with motorcyclist. For example, in our state approved defensive driving class, drivers learn that an automobile has more weight and bulk than a motorcycle. It has door beams and a roof to provide some measure of protection from impact or rollover. It has cushioning and airbags to soften impact and safety belts to hold passengers in their seats. It has windshield washers and wipers to assist visibility in the rain and snow. An automobile has more stability because it’s on four wheels, and because of its size, it is easier to see. A motorcycle suffers in comparison when considering vehicle characteristics that directly contribute to occupant safety. 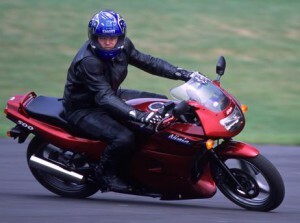 What a motorcycle sacrifices in weight, bulk, and other crash worthiness characteristics is somewhat offset by its agility, maneuverability, ability to stop quickly, and ability to swerve quickly when necessary. Sharing the road with motorcycles is important on every street in America. Whether your driving in Texas, Tennessee or Florida, all drivers can benefit from taking driver safety course with DefensiveDriving.com to learn how to share the road.